“We live life forward, but we understand it backwards,” Joyce Meyer says. 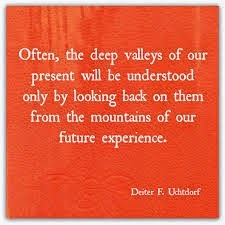 A similar maxim states that hindsight is 20/20. Unfortunately, perfect vision in the future doesn’t ease today’s cloudy eyesight. A bright future can be difficult to comprehend when the present is so disagreeable. That’s why Satan is so successful. He is a master at discouraging us. He will make us feel as though “This is as good as it gets.” The Accuser and Deceiver wants us to think improvement is impossible. After all, if we give up, he has already won the battle. Diamonds—These gems start out as soft carbon. That carbon is, eventually, formed into one of the most valuable minerals on Earth. The process of transforming carbon-based material into diamonds is painstaking. Over millions of years, unimaginable heat and pressure compresses the carbon and drives it deeper and deeper into the Earth. By the time the diamonds are fully formed, they can only be found miles under the Earth’s surface. Would you rather be carbon, or a diamond? Are you willing to take on the pressure of becoming a diamond? If you want to be a diamond, the strongest mineral known to man, are you going to worry about the seemingly strong limestone and granite that you will eventually be able to bore your way through? Few people have made such stunning transformations as this writer of the well-known hymn, Amazing Grace . Newton wrote this song of praise in order to glorify the God who had saved his life and his spirit. This man of God grew up “on the sea” because his father owned ships. Eventually, his language and manner became even more disagreeable than that of the common sailors. In addition, he and his father were involved in the slave trade. His comfortable, self-centered life turned around when he was forced (pressed) into the British navy as a common seaman. This was a demotion for him. Newton was flogged and given to an African princess as a slave. Later, a ship he was on encountered a deadly storm off the coast of Ireland. 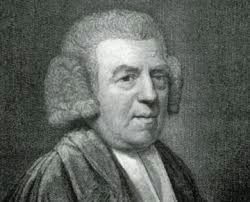 John Newton was so grateful to still be alive that he completely changed his life around. He became an ardent abolitionist and went into ministry in the Anglican Church. His most prominent song, Amazing Grace, highlights his overwhelming feelings of physical and spiritual rebirth. 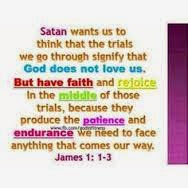 It’s not easy to endure. We may often have a desire to give up. 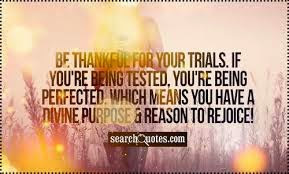 However, our trials have a purpose; they can change us beyond recognition. 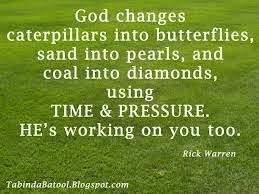 In the same manner as John Newton, God may be changing us from lumps of coal into flawless diamonds. That’s reason enough to rejoice! How has your test become your testimony?